This Site contains Oil paintings by Linda McKenny. You can travel with her on the map to places in B.C. and Alberta where her paintings began. Just click the flags on the map to go to the Columbia Valley, the B.C. Interior, Kamloops, Jasper, the Icefields Parkway and the Alberta Oilfields. These are the places Environmentalists are trying to preserve. My work allows people to become more aware of the beauty being threatened. 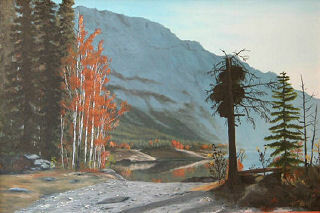 I strive to achieve a three dimensional quality that invites the viewer to enter the scene and revel in the landscape. Many collectors purchase a painting for its nostalgic value as well as its investment potential. Soon these places may be gone. New paintings are added on a regular basis, so check back every couple of months to see scenic paintings of this wonderful country. March 22, 2011 — Due to health problems, I have not posted to my website in 3 years. I did keep painting however and some of the newer paintings are shown above. More new paintings are shown in their categories ie. – Kamloops, B.C. Interior, Jasper etc. My trip to the Icefields was postponed, and I hope to go in May of this year in search of waterfalls. Hoping you are all well and wishing you health and prosperity.